Just to vent and let you all know I’m human, this was my day and the tortilla soup was still doable! 11:50am-4:30pm Made and ate lunch, did 2 loads of laundry, worked on blog, made a few administrative calls including how to cover my October hospital shifts (still seeking a new sitter and it DOES take a village), Dyson because my vacuum handle’s recline function has failed AGAIN, and calls to my meal clients. These hours FLEW by! 4:35pm Kids came home from school and settled in. Thank goodness for carpool days and those with no activities! 4:40pm-8pm Daily recaps from kids, walked dog again with them, spelling list with my 1st grader, prepared dinner for that evening, made next-day smoothies/lunches/fruit chopping, cleaned kitchen while husband did the kids’ bedtime routines. 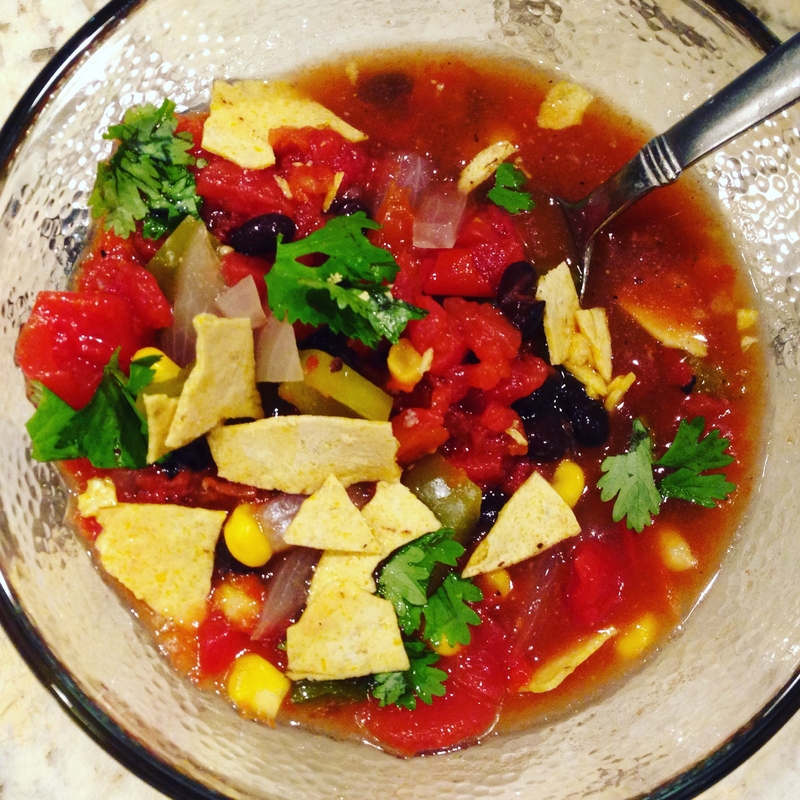 8pm-9pm Put away laundry, made this tortilla soup(! ), and talked to husband. 9pm-10pm Went on a swift 4 mile walk with a friend in the subdivision. I was so drained and grumpy that I had to squeeze some exercise in to feel better! 10pm-11pm Watched T.V. with husband – Anyone into Revenge? Then bedtime! The hours do fly by but yesterday’s prep is today’s blessing! 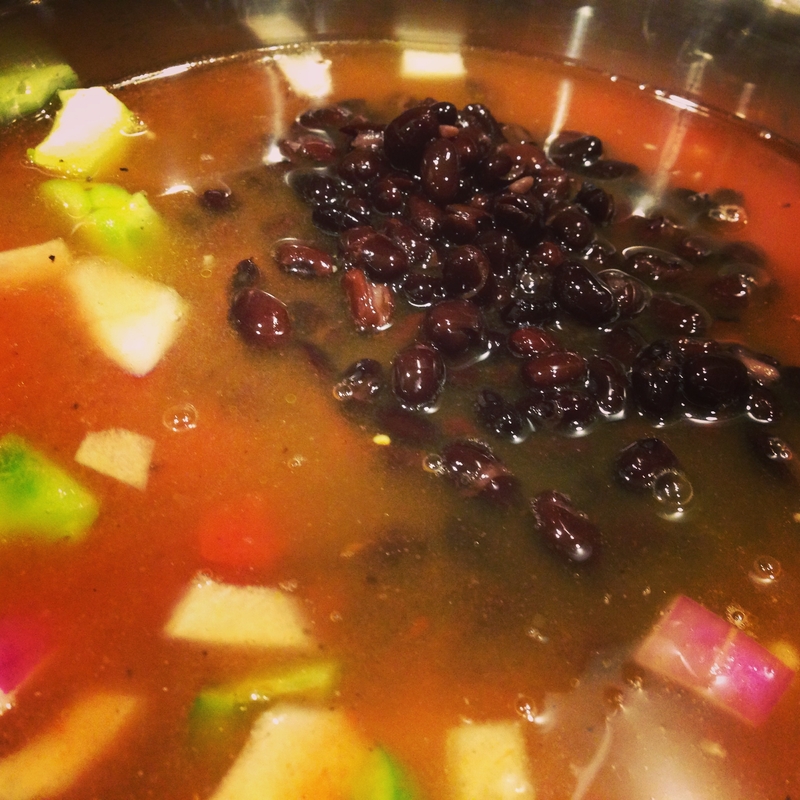 I made this soup in just under 30 minutes last night for our dinner tonight. I set a timer, and walked away to accomplish tasks while it simmered away. It was filling my house with an aroma that begged instant consumption. But I held back. This was a quick and desperate attempt at meal prep that happened to turn out really well. There is quite a bit of cumin (I think my favorite spice!) 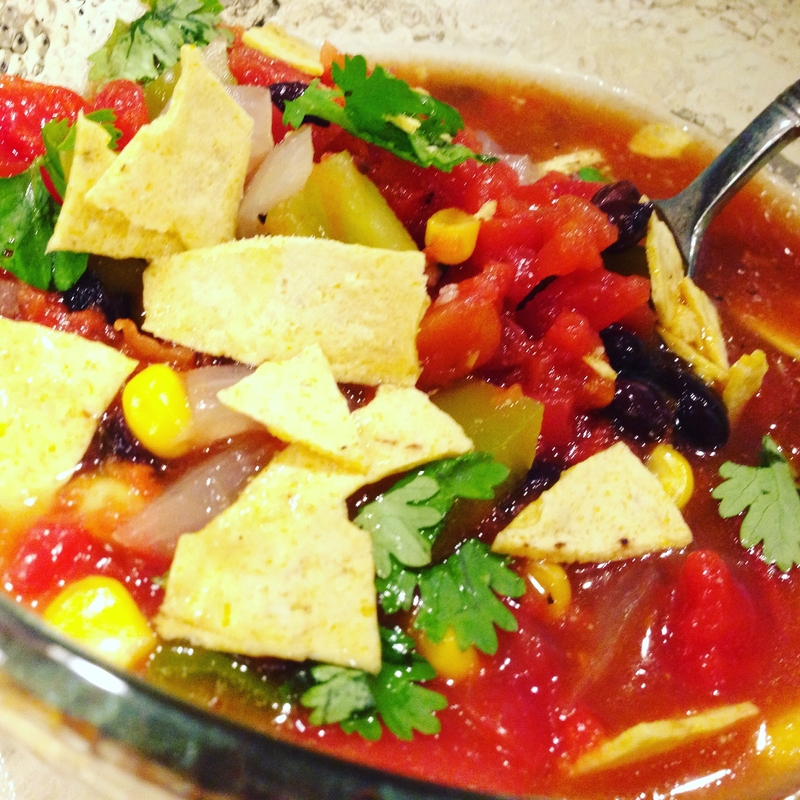 but it truly makes this tortilla soup exactly what you want it to be. So much so that it deletes the need for any other spice. Salt is a mineral and I guess pepper is a spice but you know what I mean :). I was reading some of the benefits of cumin and didn’t realize that eating it with black pepper really helps absorb this mega antioxidant and anti-infammatory smoky spice. Who isn’t all about one pot meals? 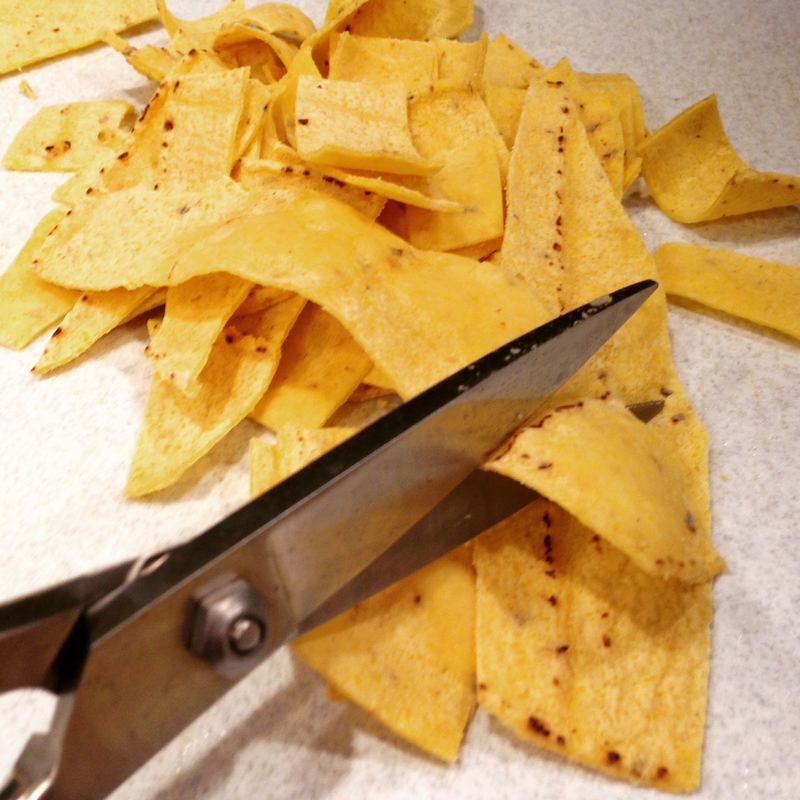 Kitchen shears were very efficient in cutting up my tortillas. You can soften corn tortillas by wrapping them in a clean moist cloth, either individually or as a stack, for about 30-45 seconds in the microwave or in a lightly oiled pan. Top with chips for some crunch! Optional boosts: Cook in 1 or 1/2 jalapeño seeded and diced, Cilantro to taste. If you don’t like cilantro, use fresh or dried oregano. Shredded cheese, yogurt, sour cream, cashew cream, tortilla chips. Prepare all of your ingredients. This took me about 10 minutes (chopping, opening cans). 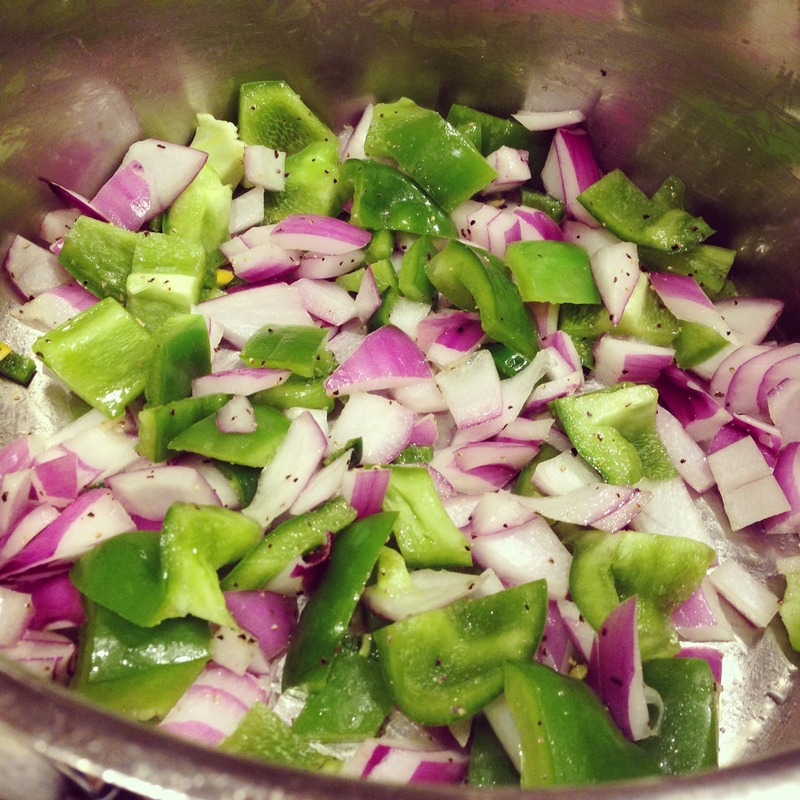 Heat oil in a pot over medium heat and saute onions, pepper, and garlic for just 1-2 minutes. 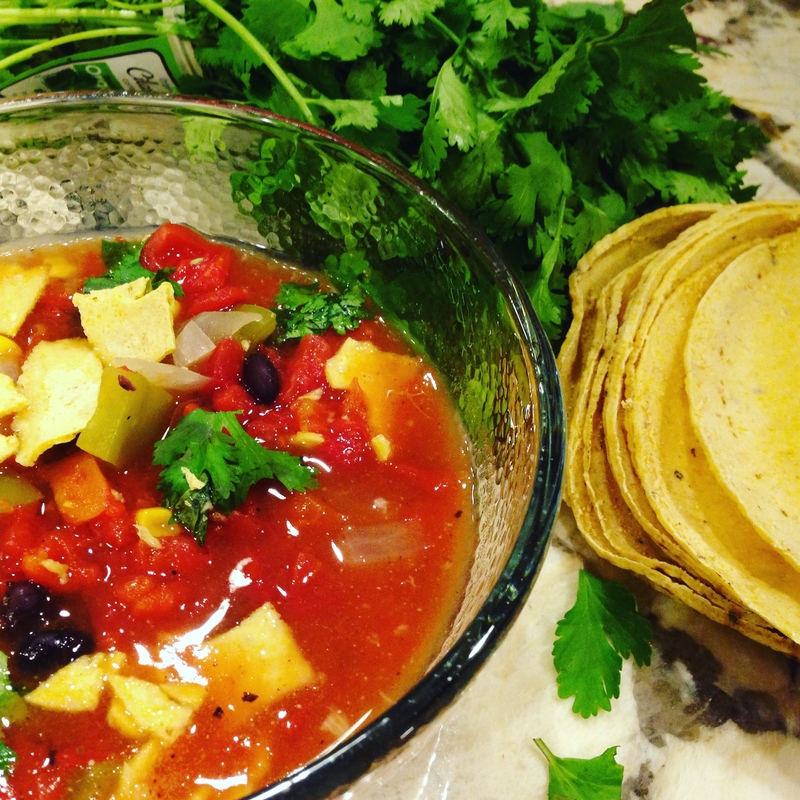 Add in remaining ingredients except tortillas, bring to a boil, cover with lid slightly ajar, and simmer for 20 minutes. Stir in tortilla pieces, garnish with extra lime and herbs if preferred. Can refrigerate for 7-8 days.